How do I import my staff members? 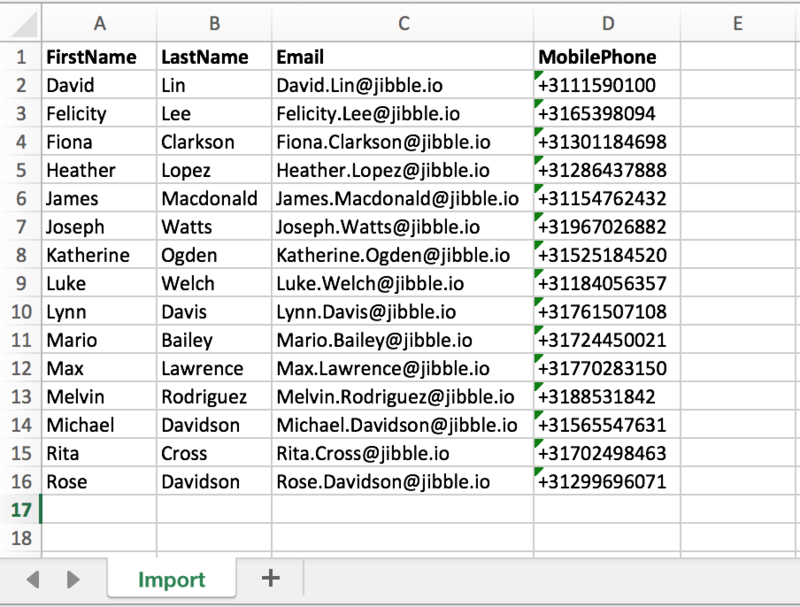 It is possible to import a large list of employees from a CSV file. You can either create new users (that may or may not have email addresses) or invite a large list of staff members to signup who have email addresses. Please read through the whole article before attempting to follow the steps. 1. Download our import template file and edit it using a spreadsheet program such as Excel, Google Sheets, Numbers, etc. Make sure you do not change these labels! Changing the labels will result in errors. In the example below is an Excel file with 16 team members that we'll invite. The phone number is optional and could be left blank. Do note that the phone number should always start with a +(country code). Now imagine in the example above you didn't have email addresses for some of your staff. This is common with blue collar workers who you don't receive work email addresses. You would simply leave the email field blank for each specific person who doesn't have an email. 3. Under "Save as" choose CSV (comma delimited) and click Save to save the file on your hard drive. Your users will be invited or created depending on what you selected. If you chose to invite and didn't provide emails for certain staff you will get a warning that the email was missing, because you chose to invite and not create. Of course they can't be invited without an email. If a person you invited is already a user of Jibble on another team, then they will be asked to join. But if they are not a user of Jibble at all they will go through the signup process before being able to join your team. If you chose to create users then you'll find that these people have been added to your team since there was no need for them to signup. If you provided an email, the user will be created with that email. The user can actually use this email address to login but will need to set a password by clicking on Forgot Password when trying to login. For users without an email you'll find that an email address was generated. Note: they will not be able to use this email address, it is only created as a form of ID to uniquely identify them within Jibble.